So maybe you’re not flaunting the latest in saber-tooth style. Or beating your dinner to death with a club hours before you eat it. You’re a twenty-first-century woman. Life has changed drastically since your ancestors discovered fire. What hasn’t changed is how your body works. You’re still sporting the same metabolic ten­dencies as your lean, toned Paleolithic sisters. Which means that achieving a strong, healthy physique is simpler than you think. What’s a modern woman with ancient needs to do? Return to her roots with a back-to-basics approach to eating that is tailored specifically to her nutritional, hormonal, and real-world needs. The Paleo Diet isn’t just for hard-core CrossFit­ters and meat-loving men. Today’s cavewoman can enjoy protein-rich, hormone-balancing, de­toxifying, and satisfying foods that will help her lose those annoying extra pounds, build lean muscle mass, and feel like the gorgeous god­dess she is meant to be. When you are able to understand the relationship that carbs have with your body, you’ll finally get the results you’re looking for—for life. The increasingly popular Paleo diet gets a female-focused guide in Cavewomen Don’t Get Fat. 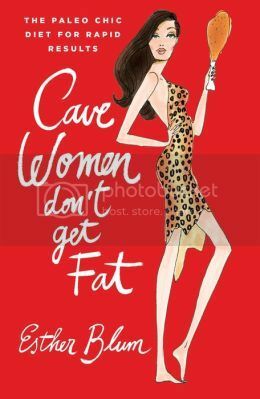 Author Esther Blum has a casual, friendly style of writing that makes Cavewomen Don’t Get Fat a pleasant read (I always like it when health books are both informative and enjoyable). If you’re wary of jumping into the proverbial Paleolithic water, this book is a good introduction. Ms. Blum’s “Paleo Chic” way of life is laid out in such a way that it looks doable, even for the busy modern woman. If you’re already familiar with the high protein and vegetable-rich Paleo diet, a good portion of this book will be repetitive (though the Paleo Chic diet does derivate from the traditional Paleo diet once or twice). That being said, if you’re a woman starting the Paleo diet then Ms. Blum’s chapters geared toward female hormones are well worth reading. Almost all diet and nutrition books require outside research before beginning, and Cavewomen Don’t Get Fat is no exception. However, Ms. Blum’s research did point me in the right direction when it came to said research. Overall I recommend Cavewomen Don’t Get Fat. Ms. Blum’s writing style is appealing, the Paleo Chic diet is well thought out, and the book is an excellent motivational tool and guide to getting back in touch with our nutritional roots.